Everything you ever wanted to know about parts, components and assemblies for the 1997 Plymouth Prowler. Information is divided into groups, which contain descriptions, part numbers and assembly diagrams for the systems and components. Approximately 200 pages. Gloss Soft Cover spiral bound. 8.5" x 11" bond paper format. Everything you ever wanted to know about parts, components and assemblies for the 1999 Plymouth Prowler. Everything you ever wanted to know about parts, components and assemblies for the 2000 Plymouth Prowler. 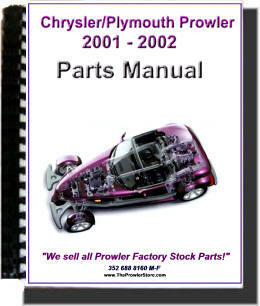 Everything you ever wanted to know about parts, components and assemblies for the 2001-2002 Plymouth Prowler. NOTE: 2001 Prowler Parts manual is 99.8% in common with 2002 Prowler. There is No dedicated parts manual for 2002 available.